Two weathered wooden doors frame a screened entranceway like portals to an otherworldly realm. A voice beckons me inside, where I am warmly welcomed by Peter Paglia, owner of Atlantic Woodworks. A long, narrow, well-organized space holds the tools of the woodworking trade and works in progress. This, the smaller of his two workshops, mirrors the scale of the woodworking projects completed here. 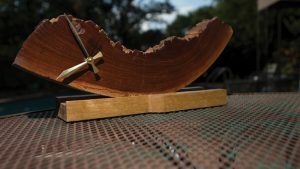 Paglia developed his craft during the eight years he lived in St. Croix, starting as an apprentice yacht joiner before moving to the United States with a supply of wood in tow. At one point, he ran a larger operation with employees in Annapolis, but then closed shop and, typifying the chameleon-like qualities of many craftsmen and artisans, picked up a regular gig at an elevator company. That move was spurred by a need for health insurance and a steady check (small business owners are often the last to be paid, taking care of their employees first). But true craftsmen can never really retire their craft, and Paglia returned to his roots, scaling down to a level that allows breathing room for exploration, experimentation, and collaboration. 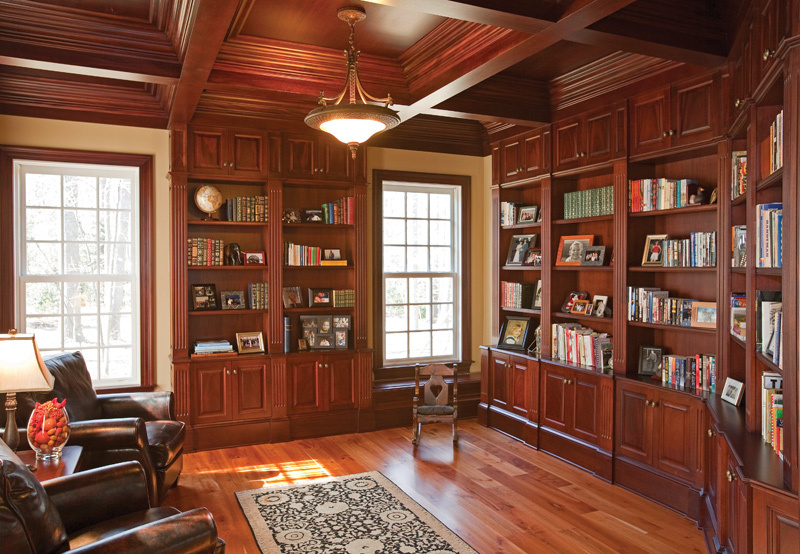 The bread-and-butter of the business is custom-built cabinetry—high quality pieces with an elemental feel. One of Paglia’s current projects, commissioned for a butler pantry, is built of solid cherry and was spawned and crafted over a period of about eight weeks. All of his signature pieces give the appearance of having organically pushed up through the foundation, as if its destiny were rooted in the very conception of the structure. Paglia has been entrusted with unusual requests, such as installing secret compartments for one client, and more intricate repair work involving a vintage set of hand-carved German chess pieces for another client. While cabinetry is the backbone of the business, another of its segments is custom-made furniture. 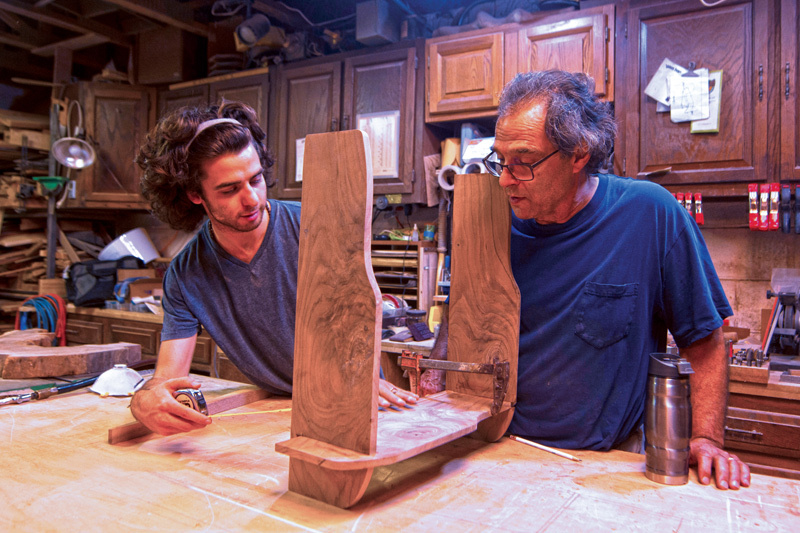 “You want functional furniture pieces that accentuate the beauty of the wood,” Paglia says. This isn’t the first time wood-as-muse is alluded to, and it seems to be a driving theme of his craftsman philosophy. An example of this melding of function and beauty is the chair, side table, and bench that were built to the order of a landscape architect’s vision. Paglia fulfills such requests using elegant pieces of wood chosen by the client. For another project, he created a vanity sink top, selecting a piece of mahogany wood with a graceful, natural curve that made it a one-of-a-kind bathroom piece. While cabinetry work represents bigger jobs and more clients, Paglia truly enjoys building furniture. “I like to pick the wood and let it inspire the design.” He says that there is so much beautiful wood, and that’s why he got a mill—so they could mill their finds themselves. “They” includes Paglia’s son Jacob, who is learning all aspects of the trade. He works on furniture pieces as well, including a lamp base from a reclaimed piece of firewood that someone thought too beautiful to burn. Jacob collaborated with local artist Anthony “Ant” LaVorgna, Jr., who created a lampshade to complete the design. Other statement pieces include tree slices as tabletops—you can imagine that you just sat down in a forest glade to take your leisure. Cool indeed. Intrigued by the idea, Paglia began studying. He got a book on guitar building and then a kit from Martin guitars to build one and see how the pieces literally fit together. They started by building 10 guitars. Then Johnny Rushmore, a renowned lead guitarist, had a vision of an electric guitar made from one piece of wood and commissioned Paglia to build it. Guitarists and luthiers will recognize the challenge of such a creative proposition, as guitars generally have multiple glued-on parts, such as the neck and fretboard. 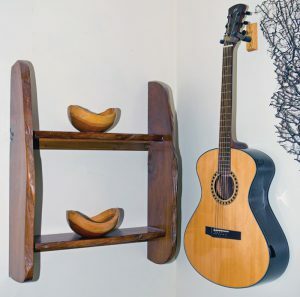 It’s Rushmore’s design, and Atlantic Woodworks has since built and finished about 20 of them. Guitars in the shop are in various stages of construction: in a work closet, on guitar stands, laying on a work bench—all are works of art that invite the eye to linger. They’re made of various woods, such as mahogany, cedar, ash, and even cocobolo, which comes from tropical hardwood trees; Jacob describes it as having the tantalizing smell of chocolate and roses. “But you’re not supposed to smell it—it’s irritating to lungs and eyes,” he says. Decorative inlays of abalone and mother-of-pearl gleam, highlighting the earthiness of the wood. The headstocks on some of the guitars feature the business’s logo, a signature wave. Non-commissioned guitars are no longer being sold, as Paglia and son are sticking with custom orders, such as an electric guitar they built for their second guitar client, Andrew White—he came in one day and asked if they had the equipment to saw wood, and has since been picked up by a company in Korea to produce and sell electric guitars there—or the reproductions of a particular model of a Stella guitar that were ordered by local artist and musician Neil Harpe. Error: Error validating access token: Session has expired on Saturday, 09-Mar-19 15:57:50 PST. The current time is Friday, 19-Apr-19 11:15:09 PDT.